We have a mailing list of people looking for this dog. I’m looking for a stuffed animal dog with long ears and limbs and beads in its feet that made it heavy. His pajamas are light blue and textured. He is made by Happiness Express, and he is approximately 18 inches long. I had the dog when I was really young, and it went everywhere with me. One time I was playing with him outside, and I accidentally left him outside. When I came home from school I found him ripped up by my dog. I cried and cried for days. I’m in high school now and, as I’m sure you know, it is really tough. I’ve been looking for the same stuffed animal dog for years now, and I would appreciate it if you could help me. 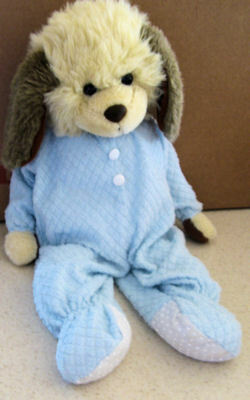 My mother said she thinks she bought the dog in the light blue pajamas from LTD or ABC, but she could not remember. I would really appreciate the help. I have a bear version of this dog – exactly the same but without the floppy ears. I am also looking for this little guy. My mom was always working out of town when I was younger and would bring me something back. I would say when I was about 4 years old she brought him home. We named him Ralphie and she use to talk with him and I every night before bed. He had his own little voice she gave him and inside jokes that I still remember. One day I found the dog version at a small toy store wearing pink pajamas. My mom ended up buying it, and she became his girl friend, Reanie. A few years ago our storage unit was broken into and everything was stolen. We were pretty sure all of my stuffed animals made it to our new house, but we just recently realized the entire box of important ones was gone. My mom was very upset because I’m 18 now and she was hoping for a little bit of the past that she could hold onto until I have kids some day. I would love to buy “Ralphie” for her for Chhristmas. If anyone finds out information on where these are available, I would really appreciate knowing also. Do not know if there are any left looking for bear, but here he is. Thanks, Carrie!! I think most who are left are looking for the bear.